(Photo: Ecumenical News / Peter Kenny)Nobel Peace Prize laureate, Desmond Tutut, the former Anglican Archbishop of Cape Town speaking at the World Council of Churches in Geneva on April 20, 2008. Apartheid fighter and Nobel Peace Prize laureate Desmond Tutu, has won the 2013 Templeton Prize, normally given to academics working in the area of science and religion. The 81-year-old activist wins the $1.7 million prize for his life-long work in advancing spiritual principles such as love and forgiveness to help to liberate people around the world, the John Templeton Foundation said Thursday. "He combines the theological concept that all human beings are shaped in the image of God, known in Latin as Imago Dei, with the traditional African belief of Ubuntu, which holds that only through others do people achieve humanity which, he says, creates 'a delicate network of interdependence.'" Tutu said after being named winner of the prize in a video on the Templeton website, "When you are in a crowd and you stand out from the crowd it's usually because you are being carried on the shoulders of others." The former archbishop of Cape Town said, "I want to acknowledge all the wonderful people who accepted me as their leader at home and so to accept this prize, as it were, in a representative capacity." 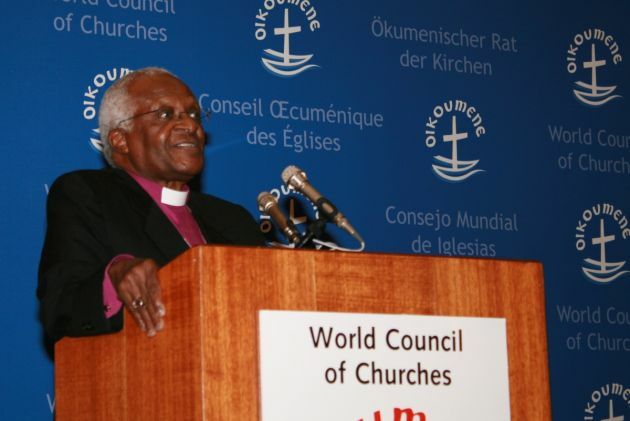 The Templeton Foundation noted Tutu's broad calls to common humanity began in the 1970s, when the Anglican cleric used positions within the church to focus global attention on the apartheid policies of South Africa's ruling minority. After Nelson Mandela's release from prison in 1990 and subsequent election as president in the country's first multi-ethnic democratic elections, Tutu chaired the Truth and Reconciliation Commission. On the TRC he employed "a revolutionary and relentless policy of confession, forgiveness and resolution that helped shepherd his nation from institutionalized racial repression toward an egalitarian democracy. His deep faith and commitment to prayer and worship provides the foundation for his message of love and forgiveness. Tutu's sense of justice has not halted with the end of apartheid and he has offered trenchant criticism of South Africa's ruling African National Congress for corruption and for the moral depravity of some of its leaders. This week Archbishop Emeritus Desmond Tutu criticised the expansion of President Jacob Zuma's home in Nklandla, in northeastern South Africa. "Who in their right minds could have approved the expenditure of more than 200 milllion rands ($22 million)? And to do it in that area, where you have this nice place standing up and just around there the squalor and poverty," said Tutu. "What is the matter with us?" Tutu has helped in peaceful solutions to conflicts in other parts of the world such as Northern Ireland and the Solomon Islands and has also been an expert for the United Nations. Tutu will celebrate the prize at an April 11 ceremony hosted by Cape Town's St George's Cathedral, where Tutu served as archbishop from 1986 to 1996. Established in 1972 by the late global investor and philanthropist Sir John Templeton, the prize is the core of the John Templeton Foundation's "international efforts to serve as a philanthropic catalyst for discoveries relating to the big questions of human purpose and ultimate reality." The 2012 winner was Tibetan Buddhist leader the Dalai Lama, who is also a Nobel Peace Prize laureate and a friend of Tutu's.